LUCY BURDETTE: Today I'm excited to introduce the Southernmost NPR reporter, Nan Klingener. 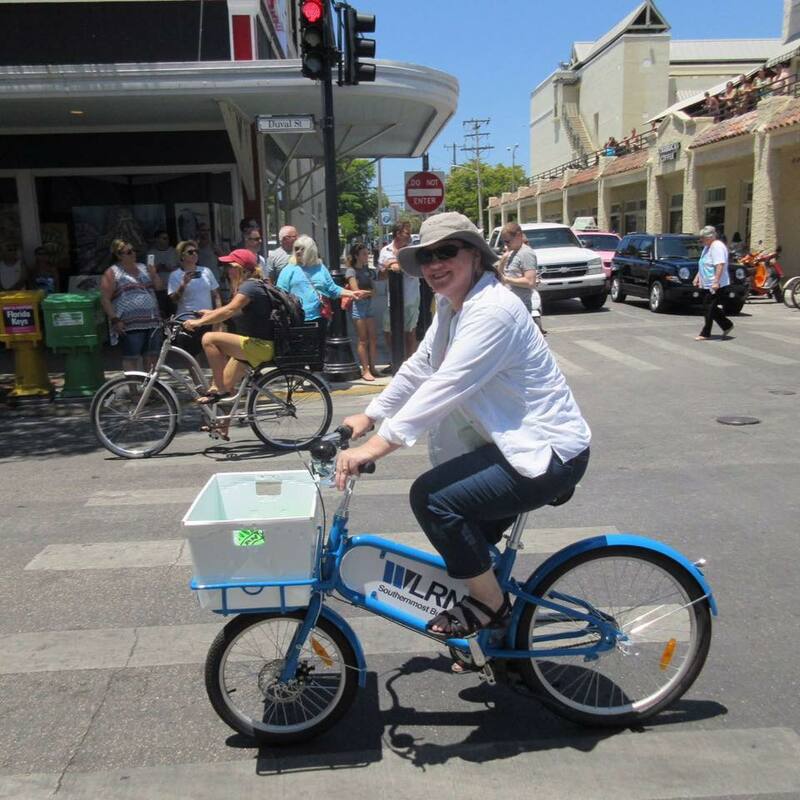 (You can see her below on her official WLRN bike!) She interviewed me for my seventh Key West book, Fatal Reservations, and I thought it would be fun to return the favor so you could hear more about her life as a reporter. Welcome Nan! I recall reading a few years ago that you went to get training for future NPR reporters. Can you tell us how that came about? And what kinds of things you learned? NANCY KLINGENER: I went to the Transom Story Workshop in Woods Hole, Mass. It’s not specifically for NPR reporters but rather a workshop about audio storytelling in all its forms. That includes public radio reporting but also podcasts — which are exploding right now — and even sound art. 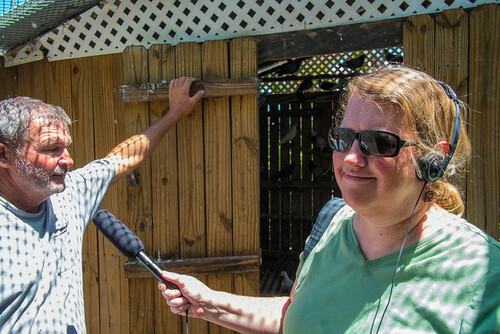 I was already freelancing for WLRN and talking to them about opening a bureau in the Keys. But I had no radio training or experience and the station is 150 miles away. My editor at WLRN suggested I look at the Transom website, because it has a lot of resources. I saw the information about the workshop and, in a reckless moment, applied. It meant I left my home and life in Key West for two months, which was hard. But it also meant, essentially, attending grad school for radio in an intensive two-month period. I learned a lot and it was actually really useful to leave my life and my routine and immerse myself in a different place and mindset. LUCY: Your range for stories is the length of the Keys. How do you choose what to focus on? What's a typical day like? NAN KLINGENER: I do cover the entire Keys — I like to joke that my commute is either a couple blocks or 200 miles. There’s not really any such thing as a typical day, except that they all start with checking what’s on email, Facebook and the local papers. I usually file a couple of what we call dailies each week — those are the stories you hear in newscasts that are a minute or so long. And I’ve always got a feature going — those are the longer stories, of about four minutes or so. Sometimes the news dictates what I’m doing but we always try to be more enterprising, which means not just reporting what the local governments are doing in a meeting but going out and finding stories. LUCY: Tell us about one or two of your favorites. NAN: I am fond of my story about a guy who breeds and races pigeons. He also rescues a lot of pigeons that are racing pigeons from Cuba that have wound up here. That was my first and so far only non-narrated story, which means it’s all his voice. It’s an interesting challenge to put that together within the time constraints and make it a coherent narrative. And it’s one of those stories that is really Keys-specific. Another of my favorites was a two-parter about the Cuban history and influence in Key West. I’ve always been into the history of this area and that’s definitely reflected in my stories. Those of us who live here can see, hear and taste the Cuban influence but a lot of people in South Florida probably don’t realize that in the 19th century, Key West was the equivalent of Miami for the Cuban diaspora. And that was before Miami existed. LUCY: Now, Key West. How did you decide to move to the island? What do love about island life, and what, not so much? How have things changed over the past 20 + years? NAN: I came to Key West in 1991 as a reporter for the Miami Herald. Back then, the Herald had a Keys section that ran six days a week and a bureau with two reporters and a part-time clerk. It was supposed to be a job that you were in for maybe a year or two and then moved on — it was famous for producing reporters that went on to great acclaim. But I just fell in love with living in a place where you could pick up the phone or walk into someone’s office. I felt much more at home here than on the mainland, maybe because I’m from New England and the clapboard houses and 19th century layout felt right to me. I had been saving up for grad school but about a year after I got here, I decided that the best thing I could hope for after grad school was a good job at a good newspaper in a good place — and I had all those. So I took the money I’d been saving and made the down payment on a sweet little condo in Old Town. That was the best financial decision of my life. I think that’s especially true for those of us who came from elsewhere. I love that even in this small town, there are so many overlapping circles and you can always meet someone or see something surprising. And I love the rest of the Keys, even though I don’t know them anywhere near as well. Each island has its own character and its own idiosyncrasies. Not so much? It’s hard to live in a place that’s an increasingly expensive resort and winter retreat. Even though I’m ridiculously fortunate in that I met my husband here and we got a foothold in the real estate market, it’s hard to see your friends and colleagues struggling to make it here, or leaving because it’s just not worth it. And it’s hard to watch your neighborhood change from being a real neighborhood, with people who live here year round, to just being a kind of facsimile of a neighborhood. At the same time as it’s been getting more expensive, we’ve also gained access to a lot of things that make life better. Some of that is just the Internet and other technology — we didn’t have public radio at all, much less a bureau, when I moved here in 1991. Back then, we only had a six-screen multiplex – we used to go on these overnight missions to Miami and watch six movies in two days. Now we have an indie movie theater as well as whatever you want to stream. And the cultural scene in general is so active as to be overwhelming during season, but that also means there’s plenty to choose from and it might be someone local doing something interesting, or it might mean an artist from elsewhere bringing their work here. I’m not crazy about the heat and stifling humidity all summer, either, but I’ve made my peace with it. LUCY: Thanks for visiting Nan! Reds, questions and comments? How interesting to "turn the tables" as it were and interview a reporter. It’s certainly a perspective we don’t often get. Nan, as a reporter, do you have a preference between doing news stories or human interest pieces? Sounds like the perfect job, Nan - I'm a huge NPR fan and are you as surprised as I am by what feels like a resurgence of radio? And aural storytelling. Great interview Nan. Are there radio stations other than NPR? I never listen to anything else. Hallie, aren't you in LA? You're up awfully early. Oh, Nan, you have such a fabulous job. I love radio--started in radio--andI think about it so often. COUple of things: You'll get this more than anyone. On my first day as a radio reporter, with ZERO experience and ZERO knowledge about how to be a reporter--(gosh, what kind of tape recorded did we use? I know I edited by physically splicing tape). ANyway, my news director, who was not happy that I'd been hired because I was the first woman at the station--decided to test my mettle on my first story. He assigned me to cover Thanksgiving dinner at the school for the deaf. ANyway, I envy your training and love your job. How does it make you think about sound? And would you say there is an NPR "style"? Do you work with an editor? I used to do features, too, and I loved looking for "the thing." My news director called me "something out of nothing productions" because I could make a story out of anything, he said. How do you do that, he asked. Because there are stores everywhere, I said. Don;t you feel that way? Welcome! Such fun to hear your stories. Nan, what a great story! And how fortunate, that you found your best niche/job/career, straight out of the chute, and recognized that graduate school would just delay your goal. That opportunity might not have existed any more by the time you finished. Our lives hinge on this sort of thing, don't they? Don't you find this in your many interactions with people every day? I've been halfway to Key West, camping on Duck or Grassy Key in the early 70's, and to Flamingo in the Everglades, but no closer. One of these days. Our neighbor of many years passed away a year ago, but he had over a hundred homing pigeons, all white. He raced them, and he also released them in groups at weddings and funerals (free for the funerals of children and those killed in the Gulf Wars). We always knew when he had a job because when they flew home they always circled over our house a few times before settling back into the coop. The last time I saw them was as they flew away at his funeral. Every time I see pictures of Key West I think, "I need to visit some time." But just visit. Not a big fan of stifling heat and humidity myself. And I think I'd miss the mountains too much. Oh wow Karen, that pigeon story is so cool and so heartbreaking. I wonder who took them over after the neighbor died? Hank, your story of covering the deaf Thanksgiving dinner is priceless. He threw down the gauntlet, having no idea he was tangling with the most tenacious reporter/writer ever! Lucy/Roberta, he knew he was dying, so he portioned the pigeons out to his pals in the pigeon fancier/racing club he was in. And one guy was in charge of releasing them at his funeral. It was so touching, and really heart-wrenching, to see them fly one last time. One of these days I will get to Key West. Even in the summer with the heat and humidity. We have the heat and humidity in Dallas, but no ocean to go with it! Thanks to all of you - my favorite stories are features though hard news can still get my adrenaline going ... that first day in radio story is amazing but somehow not surprising. I've heard many similar hazing stories from women journalists. All I can say is thank you for persevering. And Karen, it does seem odd that a decision about grad school made when I was 24 had such a determination on my life. I think I knew then that academia was ultimately not for me so maybe that helped push me away from grad school. And I was just so happy to find a place that felt like home after living in Miami for a couple years. I'm not knocking Miami, but city life is just not for me and once you've lived somewhere where your commute is a few minutes on the bike you're kind of ruined for the real world. Or at least I was. Isn't there a retreat or conference in Key West with a lot of writers involved? I recall being tempted by it--and also by applying to stay at Hemingway's hideaway! Nan, I love that you found where you wanted to be and made yourself a place there. I've been a fan of Key West for quite a while and can certainly understand its attraction. So good that you bought real estate when you did. My family is also a fan of NPR, so I think you have the best of worlds, a great job in a great place. There are so many interesting stories in that magical island. And, thank you for the information about the Transom Story Workshop. I think my son would be interested in this program. Congratulations on finding your wonderful niche in the world. What a fantastic story. Lucy, turning the tables - love it! As a refugee from the Keys (Cudjoe for me), I completely understand what you mean about how the Keys are changing. In someways, it's exciting, in others, I miss the 1970s laid back but elegant style. My series is set in Marathon, so I'm a frequent visitor, and each visit tugs me a little more. Truly, its a unique place. Thanks so much to all of you for your very kind words - and for listening to public radio! The Key West Literary Seminar is held each January - it sells out ridiculously quickly these days ... BUT there are scholarship opportunities for teachers, writers and librarians. Deadline this year is June 30! Nan, I hope to catch your stories on the radio but may have to search for an on-line recording on the NPR website. I'm sorry to be so late and realize you might not see my note, but if you do please know I enjoyed this interview with Lucy.